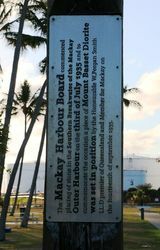 A plaque records that a piece of Mount Basset Diorite was set in position to commemorate the commencement of the building of the Southern Breakwater of the Mackay Outer Harbour on the 14th July 1935. The foundation stone of the Mackay Harbour was placed in position by the Premier of Queensland (Mr. W. Forgan Smith) on Saturday afternoon last. The Chairman of the Harbour Board (Mr. C. Bagley) said that although the cost had been estimated al £7006,000 the progress of the work gave hopes that there would be a considerable reduction on this figure. The number of men employed, Mr. Bagley stated was 281 to August 31st. and the total amount of money expended was £140,000. Proserpine Guardian (Qld. ), 21 September 1935. 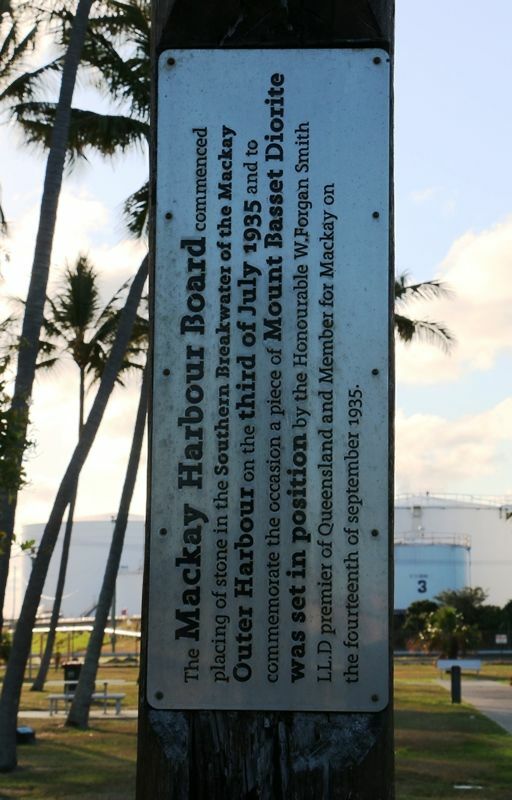 The Mackay Harbour Board commenced placing of stone in the Southern Breakwater of the Mackay Outer Harbour on the third of July 1935 and to commemorate the occasion a piece of Mount Bassett Diorite was set in position by the Honourable W. Forgan Smith LL.D Premier of Queensland and Member for Mackay on the fourteenth of September 1935.